Do you indeed desire to be my people? Then accept and do as I have required. Now that we’ve examined a couple of the Lord’s gentle invitations to us, let’s turn attention to the marvelous revelation commonly called “Answer to Prayer for Covenant,” now found in T&C 157 and 158. In this document the Lord offers an immense amount of counsel, advice and reproof. In terms of sheer volume, the last revelation I can think of that gave this much direct instruction is the Sermon on the Mount, or the Sermon at Bountiful. I speak these words to reprove you that you may learn, not to upbraid you so that you mourn. I want my people to have understanding. Can you not see that your works fall short of the beliefs you profess? Notice the mercy of our Lord as he instructs us. By rights he could thunder down commandments upon us with a voice to shake mountains, but instead he patiently, kindly explains his need to teach us, and as the master teacher, he takes upon himself responsibility for our understanding. An analysis of the revelation shows a hierarchy in the sorts of statements the Lord makes. 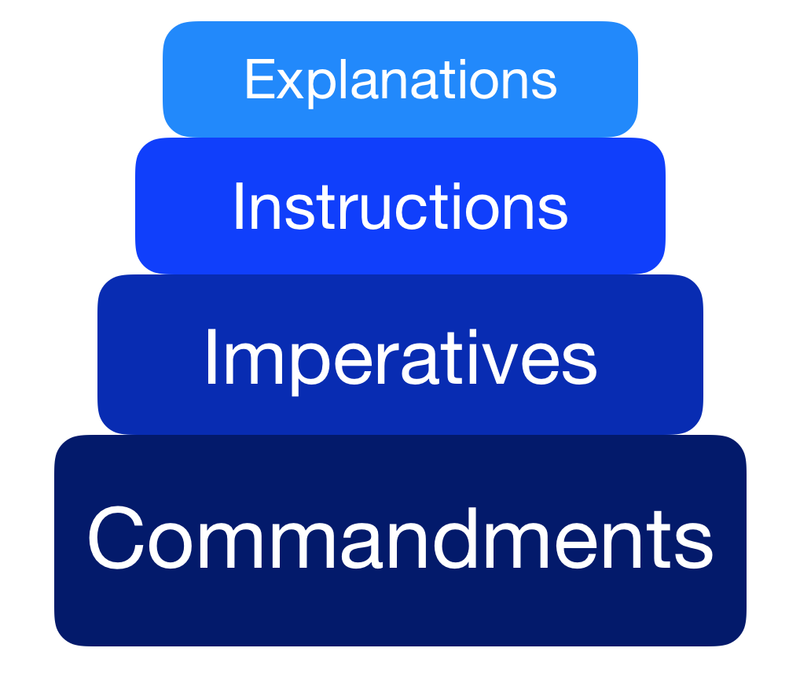 He offers explanations and instructions and to teach us, gives imperative statements telling us what we must to, and issues direct commandments. Commandments are, of course, the most forceful statements, carrying an additional weight of condemnation for those who do not obey. Let’s examine our Lord’s words, grouped by types of statements. Here are some of the imperative statements the Lord made, directly telling us what we must do, and often coupled with a principle to be understood. But remember that without the fruit of repentance, and a broken heart and a contrite spirit, you cannot keep my covenant; for I, your Lord, am meek and lowly of heart. Be like me. Forgive one another. Be tender with one another, pursue judgment, bless the oppressed, care for the orphan, and uplift the widow in her need for I have redeemed you from being orphaned and taken you that you are no longer a widowed people. Rejoice in me, and rejoice with your brethren and sisters who are mine also. Be one. Wow, that’s quite a list, but I find it absolutely beautiful. Our Lord, who is meek and lowly of heart, uses persuasion and kindness to instruct us, hoping we will deduce correct behavior on our own. He avoids harsh commandments, choosing instead to plead and teach. It is not enough to receive my covenant, but you must also abide it. Nor is it enough to say you love your fellow man while you, as Satan, divide, contend and dispute against any person who labors on an errand seeking to do my will. Come to me and I will make sins as scarlet become white as snow, and I will make you stand boldly before me, confident of my love. If you return good for evil you will cleanse yourself and know the joy of your Master. If you will hearken to my words I will make you my people and my words will give you peace. Repent and bring forth fruit showing repentance, and I will establish my covenant with you and claim you as mine. I will number you among the remnant of Jacob, no longer outcasts, and you will inherit the promises of Israel. You shall be my people and I will be your God, and the sword will not devour you. Now, having examined the above teachings, promises, and instructions, we notice the conspicuous absence of commandments, or to be more precise, the absence of statements directly expressed as commandments. To me, this indicates two things. The second thing I take from the lack of commandment statements is our Lord’s desire to teach us correct principles in hopes that we will govern ourselves. If he has to command our behavior regarding basic principles, we are clearly not prepared for higher commands to do things like gather to a holy city. We ought to take this opportunity to demonstrate our ability to internalize his teachings and govern ourselves. And finally, having examined all the other types of statements, let’s look at the only two that the Lord actually expresses as commands. Given the scarcity of this sort of language in this lengthy revelation, we should take excruciatingly careful notice of these items—always remembering that commandments bring into sharp relief the difference between cursings and blessings. Commandments come with consequences. So I command you to be wise in word and kind in deed as you write what I require of you. Whenever I have people who are mine, I command them to build a house, a holy habitation, a sacred place where my presence can dwell, or where the Holy Spirit of Promise can minister, because it is in such a place that it has been ordained to recover you, establish by my word and my oath your marriages, and endow my people with knowledge from on high that will unfold to you the mysteries of godliness, instruct you in my ways, that you may walk in my path. And all the outcasts of Israel will I gather to my house, and the jealousy of Ephraim and Judah will end. Ephraim will not envy Judah and Judah will not provoke Ephraim. Second, notice the Lord’s extensive explanation about why a temple must be built, and what he intends to do there. He doesn’t simply demand a house, but rather offers immense blessings through its functions. The temple is NOT for him, though it will be his. The temple is, in the end, for us. Did you notice that list of promised blessings? If we truly understood and appreciated the full implications of what the Lord offers, we would view this command with very different eyes. And third, notice that the Lord speaks of this commandment as an established condition, to inform us it is indeed required of us. “Whenever I have people who are mine, I command them to build a house.” He does not give the time, date, location, etc., leaving those specifics for the future. This is brilliant on his part, because once he provides those particulars, the clock starts and it’s do or die time. Literally. Such conditions accompanied the command to build the Nauvoo temple, and it turns out the clock was set for 1255 days, or just under three and a half years. Those days expired with the neglected temple incomplete, the Saints scattered, and the accompanying curses lasting to the third and fourth generation. Such will be our fate if we similarly fail. When the detailed command comes to us (and it will), the clock will start and we must succeed or be destroyed. Such dire circumstances may motivate many of us to action, but perhaps too late to accomplish what is required. Therefore the Lord shows exceeding mercy by informing us of this commandment without yet attaching the particulars. This gives us extra time to prepare—if we are wise enough to do so. Sometimes we speak of a future point, “when the command comes to build a temple,” expressing ways in which we will change and behave at that point. When the temple fund was established more than two years ago, to begin gathering funds in preparation for the project, some opposed the very existence of the fund, based on the objection, “we have not been commanded to build a temple!” The corollary to that statement was usually along the lines of, “When there’s an actual command, then I’ll donate. Until then, I see no reason to so so.” Other criticisms of the effort generally followed as well. I hope you see where this is going. We have an actual command. All who received the covenant in September, 2017 and since, are now, currently, at this moment, under command to build the temple. It is only the Lord’s mercy that has prevented the clock from starting. If we are not engaged in that effort, we are failing to keep the covenant. General principle: The Lord’s people are always commanded to build a temple. Specific application: I made a covenant to be included among his people. Therefore I am commanded to build a temple. Building a temple will require a substantial amount of money, even before the site and other particulars are known. Gathering substantial money will take time. Therefore, I should use the time available to donate all the money I can and prepare for the time when the particulars are given. Once the temple particulars are given, the clock will start and both blessings and cursings will hang in the balance. Before that happens, we should do all we can to be ready. If we fail to prepare now, the sacrifice required to hurriedly prepare under threat of condemnation may prove too sore a trial for us to complete. Therefore, those who consider themselves the Lord’s people, should be sacrificing NOW to amass the funds necessary while there’s yet time to do so. This is one of those “anxiously engaged in a good cause” moments. NOW is the time for sacrifice and preparation. NOW is the time to show our understanding and acceptance of true principles. Will we allow ourselves to be guided by gentle nudges, or will we require thundering commands to rain down upon us like fire and brimstone, to our likely condemnation? The choice is ours. Time is limited. It ALL hangs in the balance. I will visit my house, which the remnant of my people shall build, and I will dwell therein, to be among you, and no one will need to say, Know ye the Lord, for you all shall know me, from the least to the greatest. And his blog post: Why a Temple? There's a proposal to add material to the T&C, which will be voted upon at the Colorado conference next week. Behold, he sendeth an invitation unto all men; for the arms of mercy are extended towards them, and he saith, Repent and I will receive you. Yea, he saith, Come unto me and ye shall partake of the fruit of the tree of life; yea, ye shall eat and drink of the bread and the waters of life freely. Yea, come unto me and bring forth works of righteousness, and ye shall not be put down and cast into the fire. For behold, the time is at hand that whosoever bringeth forth not good fruit, or whosoever doeth not the works of righteousness, the same have cause to wail and mourn. In this series, we’ve been examining the desire for “things to happen” soon, which is a shorthand way of expressing the fervent desire of all covenant holders to witness, and participate in, the fulfillment of all that is prophesied—up to, and including, the coming of the Lord and the establishment of Zion. In today’s installment, I’d like to examine the idea of commandments and the role they play for all of us in our hoped-for prophetic scenarios. This comes as no surprise to any of us. Keeping the commandments is foundational; it’s part of the basic basic proposition of religion from the beginning—that God expects people to behave in certain, specific ways. Having been advised by the Lord to keep the commandments, the young man then asked for a specific list of commandments to be kept, and upon hearing the Savior’s list, affirmed that he obeyed them all. Good deal, right? This guy is therefore, definitely, destined for eternal life! Nope, not quite. He still lacked something, and the Savior immediately understood the young man’s missing virtue. Though the young man had obeyed a list of rules, he had never learned the lessons the rules were designed to teach. His heart had not changed. In this case, the young man lacked the attributes of compassion and mercy. The Savior therefore wrote a prescription designed to supply what was missing. It involved sacrifice, as is always required when one seeks to gain faith. Seeing that the young man’s heart was set on his treasure, and that keeping the commandments was merely an exercise in checklisting for this young man, the Lord invited him to make the sacrifice that would change his heart. Unfortunately, the young man found the sacrifice too great, and went away sorrowful. Though this young man began by “running to” the Savior, in the end he “went away.” The commandment keeping, which he thought defined his righteousness, turned out to be an empty preoccupation that had accomplished little. It had not brought about the required changes in his heart. This brings us to an important distinction we need to understand about commandments and reasoning. What follows is a simplified lesson on principles of logic; but I promise it will be painless. 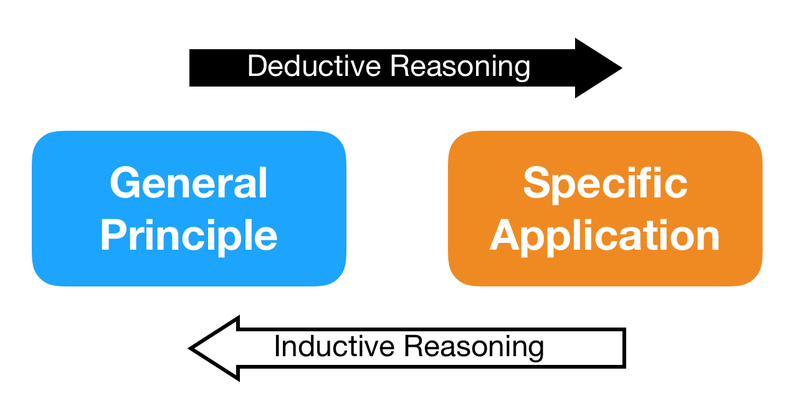 It comes down to deductive and inductive reasoning. 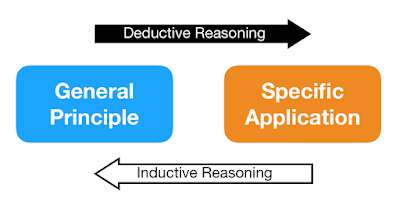 Deductive reasoning starts out with a general principle, and then deduces from that principle, specific applications. General principle: It is raining outside. Specific application deduced: Therefore, I should take an umbrella when I leave the house. Now let’s look at the opposite: Inductive reasoning. This starts with specific applications which, taken as a body, should induce understanding of the general principle. Using the same example from before, if I’m about to leave, and my mom tells me to take an umbrella, I could appropriately assume it must be raining (or at least likely to rain). The specific application induces understanding of the general principle. Of course, I could also reach other conclusions from my mother’s commandment, though they would be inappropriate. For example, I could conclude she wants me to worship the umbrella, or perhaps she fears I’ll be attacked by wombats and I’ll need the umbrella to fight them off…or maybe the sun is so bright, I’ll need the umbrella as a parasol. I could endlessly multiply false conclusions if I’m not familiar with the general principle. OK, got it so far? God is merciful. I should be godly. Therefore, I should be merciful. Easy enough, right? From the general principle “God is merciful” I can deduce my appropriate behavior. I could even take it further in specific applications, choosing to extend mercy whenever possible, for example, when I encounter a beggar. My obligation to extend mercy stems from my understanding of God. By understanding Him, I deduce correct behavior. Now, let’s try it the other way. If I start with a commandment to give to beggars, I may never work my way up the chain to understand God’s mercy. I might give to beggars because I fear punishment. Or I might give because I believe it will invoke a mysterious magic that will help my crops grow. I might even give merely because I am commanded, and never question the reasons behind the commandment. In the end, I could keep the commandment faithfully, but never become merciful or understand God’s mercy. Simple examples, I know, but hopefully instructive. Ideally, therefore, we seek and learn truth, and from that truth—that light we gather by study, prayer, labor and sacrifice—we deduce proper behavior. Wouldn’t it be wonderful if that were all it took? Joseph Smith, ever optimistic, reportedly expressed this desire when asked how he governed a city as large as Nauvoo in frontier America. Joseph reportedly said, “I teach them correct principles, and they govern themselves.” If only it were that easy. Though Joseph indeed taught correct principles, residents of the city, and holders of high positions in church leadership, conspired to commit adultery, destroy Joseph’s reputation, and end his life. Unfortunately, it turns out we aren’t so good at deductive reasoning. Varying degrees of hard heartedness, stiffneckedness, pride and rebelliousness prevent this ideal scenario. The classic example is, of course, the children of Israel, who rejected the invitation to come into the Lord’s presence, and therefore received instead a plethora of rules and commandments. 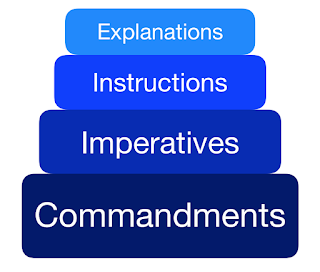 Though these commandments instructed them, the recipients failed to grasp the truths behind the commandments, and instead multiplied the commandments themselves to control and regulate nearly every aspect of life. How much are we like them? Do we, who count ourselves among the House of Israel today, display the same preference for commandments and the same failure to grasp the truths the commandments intend to teach? Are we capable of deductive reasoning, wherein the Lord simply teaches truth and we deduce correct behavior all by ourselves? Or must we be commanded? Let’s consider some things the Lord has invited us to do right now. I use the word “invited” because the Lord avoids issuing commands when He can. Think about the Lord’s language in light of what we’ve just discussed regarding deductive and inductive reasoning. If the Lord simply orders us about, and we obey because He’s God, we have given up much of our free will and power. We become mere robots, obeying commands, but never gaining the understanding and virtues we lack. This is outside the behavior the Lord defines as “do[ing] good.” It’s clearly better to do the right thing because we are agents unto ourselves and make correct choices without being commanded, based on sound understanding. If we do that, all the Lord needs to do is teach and invite, and we will use our agency—the power within us—to deduce the correct applications and behaviors. By doing so, we gain what we lack and become more Godly. This is the ideal. When, as so often happens, men fail to accept the Lord’s invitations, the Lord may resort to issuing commands, with attached condemnation of all who fail to obey, whether or not they learn and gain what they lack. But invitations are the merciful way, and we ought to receive the mercy He extends, rather than seeking the justice of commandments. So, what merciful invitations have we received for our time and circumstances? As groups of common believers, pay tithing into a common fund. Then by the voice of your own group, dispose of it by common consent so that everyone in your group knows everything that comes in and everything that goes out. Then you begin to have no poor among your group. You provide for those who need housing, food, clothing, healthcare, education, and transportation. Do it without a leader. Do it by the voice of your own common consent, by your own unanimous approval. Do it by united agreement. You will also learn how weak we all are. 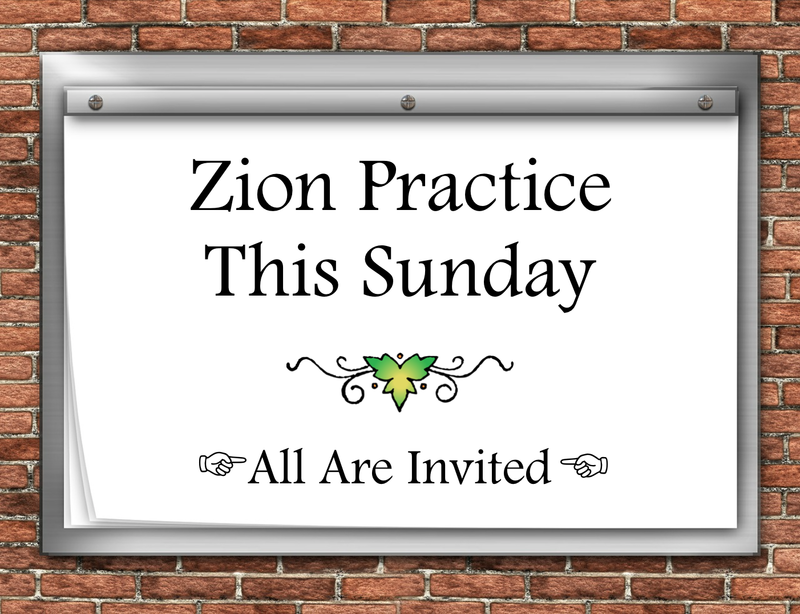 You will learn exactly what the Lord said was the problem with the first effort to establish Zion in Joseph’s day. In D&C 101:6 we see their problems in scripture: “there were jarrings, and contentions, and envyings, and strifes, and lustful and covetous desires among them.” If you want to know why the early Saints failed, make this attempt to organize yourselves. Even in a small group you will find challenges. You want to know how far away you are at this moment from Zion; this will tell you. If you want an accurate barometer of “what lack you yet?” then organize yourselves and you, unitedly in small groups, gather your tithing into the storehouse you maintain, and by your common consent take care of those who are poor among you. You will receive an education like none other in the reasons why men fail to have Zion. There’s no commandment here; rather, there’s an invitation coupled with an education. It requires sacrifice, so it can produce faith. The sacrifice is not merely money; it’s also the sacrifice inherent in learning to work harmoniously within a group. It requires time, patience, and effort. It is difficult, to be sure, but it builds the godly attributes that are mandatory for any future gathering. Of course, it’s easy enough to avoid all the group dynamics, and simply give money to a church organization, trusting that organization to do what is best with the funds. Tithing box checked, nothing learned. Or, you can give to the needy on your own, independent of a group. Doing so certainly helps the poor, and also checks the tithing box, but still eliminates the learning and growth this invitation intends. But with careful thought and good reasoning, we come to realize this invitation is not about checking a box, or even primarily about blessing the poor. The invitation is about changing our hearts towards one another so we can live together in harmony. Anything less is, on some level, a failure. Is it possible to worship the Lord without a group? In many ways, it is. But that’s not the point. The point is to prepare for a future gathering—one that we all claim we desire—by frequently gathering now and learning to function as a group. Those who choose not to do so will necessarily be unprepared for, and therefore excluded from, the future gathering into a city of righteousness. But naturally, nobody is compelled to make any such preparations. Those who find truth in the principle will apply it. Now that we’ve considered a couple of invitations designed to help us gain what we lack, in my next installment, we’ll turn from invitations to commandments. Whatever principle of intelligence we attain unto in this life, it will rise with us in the resurrection. And if a person gains more knowledge and intelligence in this life through his diligence and obedience than another, he will have so much the advantage in the world to come. Among those who have entered the covenant there exists a good number whose spouse is not currently open to, or accepting of the message being delivered by the Lord’s servant. The reasons for their disinterest, or opposition, varies. Though situations and details are unique, each of these covenant holders experience struggles and burdens that cause them to mourn and stand in need of comfort. Each of us probably know dozens in this situation that we love and care for, and have grieved with them in their challenges. Is there anything we can do to help? Is there a way we can unite our faith in their behalf and for these currently “unbelieving” spouses? Alma and the people of the church in his day show us a precept we believe we can apply (the “doing”). It was the united prayers and fastingof Alma and the Lord’s people that brought about the mighty change in Alma the Younger and the sons of Mosiah (NC Mosiah 11:26; 27-28). A few of us would like to invite any who desire to unite your heart and voice in behalf of our fellow covenant holders who currently find themselves on this journey alone and apart from their spouse, and petition the Lord to soften the hearts of the unbelieving spouse, and to bless, comfort and guide these specific covenant holders within their marriages as they navigate these uncharted waters in patience and love. We will be fasting and praying specifically on four consecutive Sundays leading up to the coming conference (March 17, 24th, 31, and April 7th). 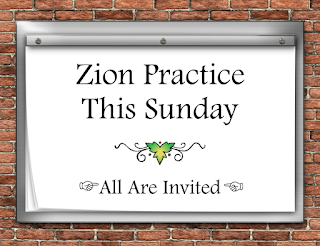 We invite as many of our covenant family to join with us for any or allof these days. A fast may be anything you choose as a sacrifice; be it a traditional fast, refraining from electronics, sugar…or whatever the spirit confirms is an acceptable sacrifice on your part given your circumstances. We want as broad a participation as possible for those inclined. As a people, we are seeking to become more united. We believe applying the precepts of the Book of Mormon by uniting our voices in mighty prayer and fasting in behalf of those among us who mourn and struggle with this challenge can result in miracles. The organizers of the upcoming general conference in Colorado (April 19-21) have asked me to post a quick reminder: If you are planning to come to the conference, please RSVP so the organizers will know to plan on you. I know what goes into organizing one of these conferences, and I know it's very difficult when you don't know numbers for planning purposes. As a courtesy and kindness, as well as simply politeness, please help them out. If you are attending, and have not yet done so, PLEASE RSVP to let the organizers know to plan on you.